Kirkwood Trading Company is a local custom t-shirt screen printing business located in St. Louis Missouri. We have over 20 years of printing experience and offer a full line of apparel. All of our printing and numbering and lettering services are performed in-house to ensure quality from one job to the next and with better quality control we can meet or exceed customer deadlines better than any other company in the area. We carry the name brands our customers know and trust. In addition, if you are new to ordering custom tees, we have the experience to help you make the right choice based on your needs by looking at shirt styles, brands, and materials. If you need a free price quote on your we make it easy. We offer our customers several options for getting a free price quote. They can email us under the contact us page. They can call us as well. A couple fun features are our design online custom t-shirt design studio and we also offer an online quote form. So whichever option works best for you, we offer it. We strive to make our customers awe at the t-shirt creations we make. If we don’t have your logo or design looking completely awesome then we are not doing our jobs correctly. With our experience and know how we can tackle any job and no job is too big or two small as long as it’s at least 12 shirts. 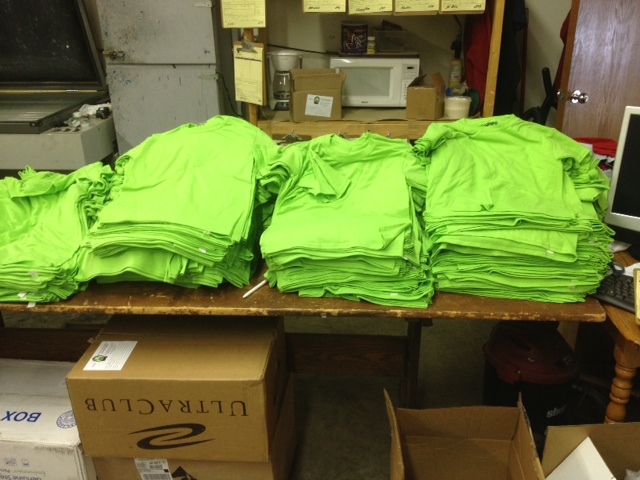 Our custom t-shirt screen printing is geared towards our customers needs. Screen printing is an art and it takes experience to do it correctly in order to provide the best custom t-shirts on the market. For over 20 years we have been doing just that. In addition to t-shirts we offer a full line of apparel from sweatshirts, sweatpants, ladies apparel, youth apparel, polo shirts, button down oxford shirts, shorts, hats, blankets, bags, and much more. In addition we also provide custom athletic uniforms and jerseys for team sports. Our lettering and numbering services are also performed in-house as well. We can screen printing on several different kinds of t-shirt materials from 100% preshrunk cotton to 100% poly and all of the blends in between. Currently the trend is leaning towards softer thinner t-shirts where ten years ago everyone wanted very heavy standard fitting shirts. Regardless of your preference we will provide you with fast custom t-shirt screen printing on each and every order you may have. We can be contacting at http://kirkwoodtradingcompany.com and we’ll be happy to quote all your custom t-shirt screen printing needs.